Taylor produces a lot of quality acoustic guitars and the Taylor 100 series of acoustics are no exception. They might be at the lowest end of Taylor’s collection, but they are still quality instruments – and you can enjoy the Taylor experience at a much lower cost. Ranging from $798 (USD) MSRP to $1058 (USD) MRSP, these are still in the mid-range of guitar prices. Though you will find the “actual” prices are cheaper than this. What these guitars benefit from is the technological advancement that goes into their higher end guitars and trickles down into these guitars. You might not get all the same materials as you would on higher end guitars but you get the build quality. In my opinion that means that Taylor’s 100 series guitars give you a better guitar than most can make in this price range. O.k. let’s take a look at each of the guitars in the 100 series. The 100 series is made up of the following guitars. I like how Taylor keeps their names simple and easy to understand. The first number stands for the series the guitar is in. The 1 signifies that these are 100 series guitars. The second number signifies the type of guitar. 1 means a 6 string guitar, 5 means a 12 string. So without even going into detail you can see what the difference between each of the models is by their names alone. O.k. but let’s take a look at each model in more detail. Using laminate wood back and sides is what saves considerable money in this model. Also the 110e doesn’t have a cutaway which reduces the cost further. However, this isn’t necessarily a bad thing. If you don’t tend to use the upper frets then this won’t be an issue and I actually find that a non-cutaway tends to have a fuller sound when not plugged in. The 110ce is essentially the same guitar as the 110e except that it has a cutaway. The price goes up considerably to have a cutaway. Worth it if you really need that cutaway – but if not, then save yourself some cash and go with the 110e. The 114e is the same as the 110e except for one major difference – it has a different body shape. The shape is Taylor’s Grand Auditorium shape. This is a great all round shape for doing a bit of everything including various genres and styles of playing, including fingerstyle, flat-picking and strumming. If you incorporate a reasonable amount of fingerstyle and want one guitar to play everything on then the 114e over the 110e might be the better choice for you. The 114ce is the same as the 114e except that it has a cutaway. If you really need a cutaway you pay for it – but if you need it you need it. If you don’t need it then save yourself some dollars and go with the 114e. 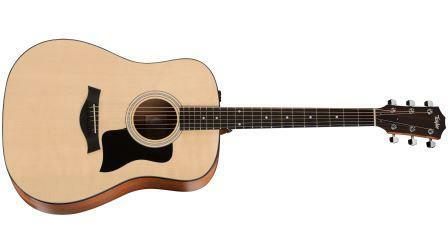 Last and not least we have the 150e – which is the 12 string version. The 150e is again very similar with the same woods, the same scale length, same electronics etc. The major difference is that it’s a 12 string – which also naturally means that the neck width is a bit wider. The 150e has a nut width of 1 7/8” (47.6mm). The one other difference is that it has a Nubone saddle, whereas the other models use a Tusq saddle. Otherwise the 150e has all of the same features as the 110e. The prices listed above are the manufacturer’s suggested retail price (MSRP). It is seldom the case with guitars that you’ll actually pay the MSRP. 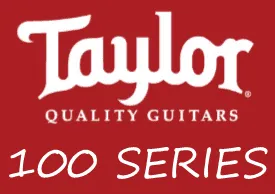 Thanks for reading and I hope you’ve learned more about Taylor’s 100 series guitars. Check out my review of the 110e at the link below to learn more. So am i right in saying that all these guitars have the same specifications in terms of electronics and weight? Is it just the sound which divers from the specific taylor models? 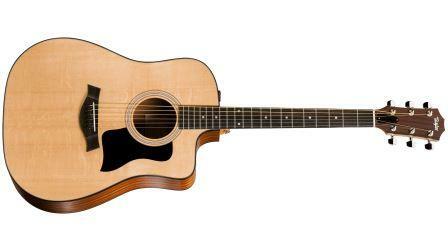 As someone who is interested in guitar playing, would these taylor guitars be suitable for beginners who have no experience? Yeah they all have the same electronics. In terms of weight, I’m not sure the specific weights of each guitar but they probably differ a bit in terms of weight. Models with cutaways and models with different shapes will have slightly different weights. But yeah for the most part I’d say they have prettty similar weights because the materials used are pretty similar for most models. The 12 string might weight slightly more. I wouldn’t worry about the weight of a guitar though. In terms of for a beginner, I think these guitars would be great to learn on. Because of their quality they’ll definitely stay in tune and the intonation will be consistent (important for a beginner) and also they’ll sound really good. The actual prices of these guitars actually makes them within the budget for a beginner too – albeit at the higher end. There are certainly cheaper guitars you can get that would also be suitable for beginners. In terms of which model would be best for beginners – I’d go with one of the 114 models. Just that grand auditorium shape is probably slightly easier to deal with than the dreadnought. Definitely don’t start on a 12 string so rule that one out. You probably won’t need a cutaway as a beginner – so you could save yourself some money. Which narrows it down to the 114e as being the best choice for a beginner from Taylor’s 100 series.